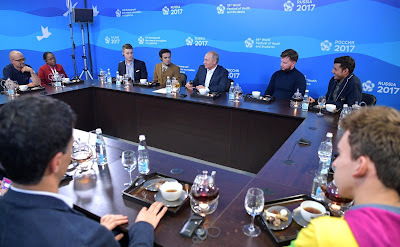 Vladimir Putin met with festival participants – students and young specialists from Russia, Malaysia, Indonesia, France, Jamaica, the United States, India and Zimbabwe. Vladimir Putin with participants of 19th World Festival of Youth and Students. Mr. Putin, good evening. Starting today, we can consider our World Festival of Youth and Students open. As we speak, Sochi is welcoming over 30,000 young people from 188 countries, all with their own unique history, projects, ideas and expectations. I think everyone present here will share this with us today. Mr. Putin, the floor is yours. Let me begin by welcoming all of you. I have already seen some of you on stage today. Each of you has had an interesting life. Even though you are young, you have already achieved something in life as you have shown your worth, conducted yourself with dignity, benefiting both yourselves and the people around you. This is how it always goes: when you live and work for the benefit of others it always pays off in spades, as they say; this approach will always benefit you, stimulate, help you develop and make you more successful and evolve as an individual, and will open many doors for you. First, I would to welcome you and express my hope that you will like it here in Sochi, in Russia; I hope you meet interesting people just like you and learn how they live and what they strive for and what they can offer, so that you can compare their experiences with your own abilities and plans. I would very much like it if you were to receive fresh ideas in this connection, which would inspire you to move forward. I want to thank you for coming here and to express my hope that this event will leave you enriched with additional knowledge and experiences, including an opportunity for you to experience Russia firsthand. Our country is very wealthy, I mean primarily in terms of its culture, religion and traditions. We do not even know the exact number of ethnic groups living in our country – some say there are 160, others say 190. This is a true melting pot of cultures, history and religions, as all these people live together in a single country. There are many countries that have people of different ethnicities and languages, and we have representatives of such countries here today. Russia may not seem unique in this regard – but it is unique because our country has always been highly tolerant of other cultures, languages and faiths. It began its path as a multi-ethnic country and its underlying foundation has always been respect for its neighbors, for other nations, ethnicities, languages, cultures and religions. This has always been a fundamental part of the development of the Russian state. It would be a great pleasure for me were you to feel this special atmosphere in Russia during your visit and then take these emotions back with you, and not just to keep, but also to maintain these new contacts and ties, which, I am sure, will be beneficial to you as you advance and progress further – not in your personal development, as I think you are accomplished individuals already, but in achieving new milestones and reaching new heights. As this meeting’s moderator, I would like to give the floor to Afroz Shah, a young lawyer and environmentalist from India. Afroz, please. Very good evening to you, President Putin. It is a pleasure and an honor to meet you. I work in a sector, which is long forgotten in my country, picking up garbage from the ocean. Mr. President, we are all aware that marine litter is like a big problem. I needed to react to it. And I did not know how to react because I work as a lawyer in a court in India. We have seen laws in motion, policies in motion, regulations in motion. And I as a lawyer felt there are too many of them. What was required was ground action. And there seemed to be too few activists in my country. So I said I am going to use my two hands as my best tools. What a policy would tell you to do or what a law would tell you to do or what a court order would tell you to do I started doing before the court. 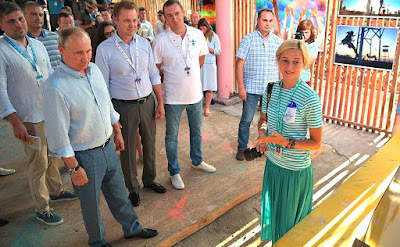 Vladimir Putin at the meeting with participants of 19th World Festival of Youth and Students. And I came to understand that if young people or people on the ground start to take care of the ocean as they should we will have a better and healthier ocean. What we do when we want to participate in a democracy is we do two things: we vote and we pay our taxes. And after that we wait for our governments to react. We want the government to react, saying that protection of the environment is the job of the government or a court. But I think otherwise. We have litter and I am responsible for it. The state of this planet is my doing. And I am a firm believer in what the great leader Mahatma Gandhi said. He was very clear: you do not need an NGO; you do not need a bank account. You can be the change yourself. This is how it should be, from bottom to top. It is an illusion to wait for policies to come, for regulations and laws to take effect. The laws, policies and regulations are supplement. They help to push the masses. But those who throw plastic into the ocean must be fully responsible for the protection of the environment. And that is what I do in Mumbai in the end, cleaning up lakes, rivers and the ocean. It is becoming a mass movement now and I like it because there is a sense of belonging that we have lost to our planet. Our homes are our homes, our cars are our cars and our assets are our own assets, but when it comes to the environment, we just type on Facebook and Twitter. This is the problem now. But we do not know how to react to it. The solution is that everybody must put their hands to it. I always tell people: you have 168 hours in a week. Two hours you must commit to the environment, to connect in the sense that you get back this sense of belonging that which we have lost. The fact that we are throwing plastic or litter into the landfill of the ocean is the result of the mindset that we have. This is not mine. My house will be clean. If you had to sleep on a bed full of plastic you would be horrified. You would make sure that everything is cleaned up. That approach must be applied to everything around you, your neighborhood, your ocean, your forest or your mountains. By cleaning the ocean we are doing precisely that. The cleaning of ocean, beach, forest is not the only consequence we are looking for. What we want is the changing of the mindset. Law will work on a platform and illusions will work on a platform and eventually we will have a world someday that people will say ‘yes’ to respect the law and we will see it being enforced. But before that, I should take up enforcing it. So this is my take on the environment which I am working very hard for in Mumbai. I hope someday I see a better ocean. If you come to Mumbai I cannot even put my hand into my ocean. I have lived near a port since my childhood, I have been in that water, but I cannot even put my hands into the ocean because there is a danger I get a disease. I feel people on the ground must get involved. People who are throwing plastic, litter, solid garbage, liquid garbage – they will have to come onboard and understand that this is not only the job of the government. Presidents’ and prime ministers’ job is not only that. They have other things to look at. We have to get connected there and say: we are community, I have a sense of belonging, I work hard for it. So this is what goes through my mind when I work there in Mumbai. And hopefully, Prime Minister Narendra Modi is backing me. It is a great moment, I am loving it. I want my whole country to be clean, I want the oceans of the world to be clean and I am working for that. Thank you, President Putin, for giving me an opportunity to be here. I must thank the organizers as well. They have been brilliant, I have been here for three days and I have never seen such zeal and energy that I see here. And hopefully, I will take a lot of it back to India. I always tell people we must take from these youngsters, they are leaders. They must lead on. Thank you. To begin with, I am sure that you are aware of the special, trust-based friendly relations that have developed between Russia and India over the decades. I have very good relations with the Prime Minister of India. I know that he is concerned about the environment, and therefore you will certainly rally his assistance in this matter. 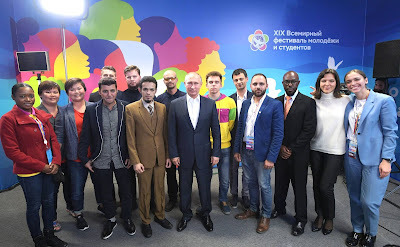 Vladimir Putin during the meeting with participants of 19th World Festival of Youth and Students. This is a growing problem, and it turns out that it does not have a simple solution, because environmental issues, including transitioning to the best modern technologies, are far from simple because the introduction of modern technology calls for additional funding. Many countries, and particularly the developing economies, may not have these funds. This is the first element. Secondly, unfortunately, to transition to modern technologies corporations must be forced to adopt these new technologies. This means that, first of all, the introduction of these technologies can cause many people to lose their jobs, and they should be offered new jobs. In other words, we need to consider how to assist these people in finding new employment. Secondly, we will have to divert resources to implementing these modern technologies. The companies say that this is an additional burden, which they may be unable to shoulder amid economic difficulties. Therefore, governments have to choose between contradictory decisions. Ultimately, the future belongs to progress, and modern or cutting-edge technologies will eventually increase productivity and improve the environment in which we live. I have a question for you. How did you organize this? Have you created a recycling company? Not at all. I did not create a company. What I have done was what my leaders, people like Mahatma Gandhi did, only voluntary action. I have no NGO, no company, no bank account. We have people coming in every week. It is based on our love for the environment and our love for human beings. I strongly believe we have lost touch in that sector where too much reliance is placed on formal responsibilities of parliament at times. I think if we connect with the human beings, we connect with their minds, it works. So it was purely voluntary action. I go to schools and colleges I initiate cleanups. I not only do it as a citizen. I get the plastic manufacturers also involved, those that manufacture plastic packaging. Because the problem must also come to their heads that plastic in the ocean is a big problem. We had more plastic than fish in 2015. As we both know, plastic waste in the oceans is a problem. You are aware of this because you work in this area, and many people are becoming aware of this both here and in other countries. Plastic bottles already form entire islands in the Pacific Ocean. According to experts, this can change the ocean’s temperature and create environmental problems on a global scale. This is a serious issue and, by the way, we should probably search for a legal solution to it on both the global and national levels. We can consider creating certain favorable conditions for cleaning the oceans of these problems. This is a very serious matter. Emotional appeals and your professional skills as a lawyer can help resolve it. As I see it, we can and must think about this. By the way, I had the pleasure of greeting the Speaker of the Indian Parliament who attended the Inter-Parliamentary Union Assembly (IPU) in St. Petersburg yesterday. Gamal, you have the floor. Gamal, a young doctor from Indonesia. I just saw you on stage. Thank you very much, Mr. President. It is a great honor for me to come here. This morning I called my father and mother to say that I will meet you. They were very happy. I am a medical doctor. I finished my bachelor degree last year. But during my studies I started a foundation that focuses on access to doctors for poor people. First, when we started the company we developed micro-insurance. So we use garbage to help people get access to health services. People pay our company with garbage to get health insurance. They can get an operation, get hospitalized, get medication and pay with garbage. With this concept, we can solve two problems at the same time. Without this concept, poor people usually think garbage is useless and health is expensive. Now they can come to our clinic free and pay with garbage every month. So this concept enables financing and helps poor people to get health access. And another innovation is our online platform to help people get medical services. If poor people need money for an operation they can upload their request on the website and people will do it. It is very simple to bring together volunteering and social media. And the next innovation we have is called Homedika. So I have a dream. I am from Malang city. Maybe people from Bali or Jakarta, Indonesia are sick, I can send a medical doctor to their home directly. So with a phone platform, mobile apps or website, if your neighbor is sick, you just open or download the application, enter the province, the medical doctor and then you order and the medical doctor will come to your home. Poor people get it free but rich people pay for it. So with all this innovation we believe that one nation can help exercise the fundamental human right. So we want to give health access to everyone in the world. You are addressing one of the most important and noblest issues, with obvious results. This is a special mission, rather than just a profession. This is why I always respect doctors very much. Apart from the humanitarian aspect, healthcare has acquired an economic aspect in the modern world. People with health problems find it much harder to master the knowledge needed to develop a modern economy, and they find it much harder to work efficiently. Again, healthcare has therefore become a humanitarian component and a purely economic factor. The state must invest its resources in these two important areas, healthcare and, of course, education. What is more important: healthcare or education? It is not easy to answer this question. Human lives are priceless, and healthcare is therefore somewhat more important than other activities, in some respects. Regarding free medical assistance, the one and only mission of healthcare is to help people. But we need to be careful when it comes to organizing the medical industry’s operation. People need to be aware that they are responsible for their own health. We need to consider exactly where the government needs to provide free medical assistance, in which segments, amounts or areas, and where it can act as a co-sponsor. I will not try to define that now, but is something that concerns the foundations of peoples’ health. This is important. As you may know, debates on the healthcare system are underway in some countries, for example, the United States, on whether the government is obligated to provide full medical insurance or not, and who is eligible for insurance. I believe the system should be organized so that everyone has access to healthcare and healthcare services. In my opinion, this is an area where you can certainly pool your efforts with those of your Indian colleague, that is, legal experts can work with those who are directly concerned with people’s health. Overall, your idea and what you are doing deserve respect and support. Thank you for this. I would like to give the floor to Artem Oganov, a Russian scientist. I would like to note that he is on the Forbes’ list of 50 Russians who changed the world. We are very proud of Artem. Artem, you have the floor. Yes, you have a good memory. You meet with so many people. I left Russia in late 1998 because, at the time, there was no future for a scientific career, generally, nor prospects in my situation. I completed a postgraduate training course in the United Kingdom, and I worked there for some time. Then I moved to Switzerland and then to the United States. While in America, I worked my way up and became a professor. To be honest, I believed that I would spend my whole life there. The West was very kind to me, I have to say. Later, it became possible to work in Russia; the mega-grants began to be issued. I started spending four months each year in Russia. And I liked it so much that I decided to move back to Russia and to reunite my life with the country that was truly mine. Now I live in Moscow, I have three children, and a fourth baby is on its way. My dream is to have six children. Mr. President, my wife’s opinion of all this is another matter. I like working in Russia, living in Russia, and I like bringing up my children here. This country has a wonderful education system, life is interesting, and Russian cities are beautiful. To me everything is changing in the right direction here. I like the students, the young people who are interested in science. They are very talented and enthusiastic. There are some unique young people. As in my case, good opportunities for research projects are being created here, such wonderful young people are also involved, and we are focusing on entirely new subjects that I would not have been able to think about in the past. Today, I… in a word, I have no regrets about my decision to come back to Russia. We design new materials on computers, and we predict the structure and properties of various substances. I remember mentioning Gorynin from St. Petersburg and the research institute during my conversation with you, right? We see an interesting and unexpected effect. My colleagues who live in the West sometimes ask me, “How are things in Russia? Aren’t you fed up yet? Or is it really so interesting and comfortable to live in Russia and there are good guys there?” I reply that everything is fine. Some then ask if they should return to Russia as well. I tell everyone that they should return because, ultimately, all countries are equally wonderful. I believe that no country is better or worse than others are. However, there is only one special country for a person among the more than 200 countries, it is the country where you were born. I am very happy that I have made this decision. I hope that the scientists who left Russia, and there are hundreds, or at least dozens of thousands of them, will be able to return to Russia and resume their work here. I am glad that you have found your place in life. This is not easy to do when you leave, neither is it easy when you return. As I see it, you have returned because in the first place you have found your place in life. The project we have launched, the mega-grants, one of which helped you return, is ongoing thanks to you and your colleagues from various spheres of research. When you and your colleagues said that you needed not one-time funding but a promise of funding for several years, at the least, we decided to continue with this mega-grant program, and we have found sources for funding them. We will do this just as you recommended and asked us to do. I guarantee that we will continue this for several years to come. What I liked most during my meetings with your colleagues in Moscow is that they spoke not only about where it is better to work, or how, but about organizing this work so that young researchers would remain connected to their universities, which could become their work places in the future. This means that we must create laboratories, plus administrative, organizational, living and other conditions for them, so that they would come in full force and feel comfortable here. We have agreed that the mega-grant program will be divided into several stages for attracting young researchers from among post-graduate students and young researchers with post-graduate degrees. 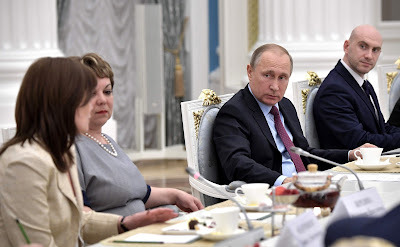 Frankly speaking, it was especially gratifying that our researchers, our young researchers, many of whom worked or are still working abroad, are concerned about this aspect – the future of Russian science, and they are thinking about how to organize this work in the best possible manner. We are especially grateful to you and to all your other colleagues for this. You know, the question of young people is of the utmost importance, and it is good that you have touched upon this. I have been a dreamer all my life, I always dream about something, and my head generates ideas all the time. For a long time now, I had a dream that some concept would be developed that would allow Russia to attract the best scientists once again. Mega-grants are now stipulated. So I thought, it is good that leading scientists have been attracted, but it would be good if our young scientists did not leave at all because they will also become leading scientists in about five to ten years. It would be good to create the same conditions for them, so that they would be able to unlock their potential without going anywhere, and hence a promising young scientist would be able to set up a mini-laboratory here, to spread his or her wings as well as to make his or her dreams come true. A concept allowing young scientists to establish mini-labs has emerged. I wonder what this is. Has some machine, making it possible to fulfill my wishes, been created? Maybe, it is good that I am telling you this today, but I am now dreaming that our emigre scientists would return on the same scale as they had left, rather than by the dozens and hundreds, and that at least the most promising ones would come back. This would be wonderful not only for our culture but for our economy as well. We will consider this. And not just consider – we have certain ideas. This may sound rough, but I will say it, nevertheless. Russia is interested in having those who have asserted themselves and who can work effectively here to return. It is not interested in just anyone coming back. Although we are interested, from the civic standpoint, that all our citizens should come home. However, Russian science needs those who can help it move forward, in the context of its development. Thank you and good luck. By the way, where are you lecturing? Today,I am at the Skolkovo Institute of Science and Technology. I would like to transition to the female part of our team and give the floor to Reeshemah Krystal Ball, a young artist from Jamaica who represents the creative part of our festival. It is a pleasure to be here. My mother is going to go crazy when she realizes what I am doing right now. I did not expect this. I am just a young Jamaican girl trying to change certain things. I am an artist, I believe in charity so I donate my time to recovering cancer patients and terminally ill cancer patients. But when I am not doing that, I focus on a bigger issue right now in my country, which is climate change. We are being severely affected especially in the Caribbean region. Jamaica is an island. Our beaches are eroding. And the only source of income is tourism. So when we lose our beaches we will lose the product we are trying to sell to other people who come our country. We also have an issue with a very active hurricane season that has basically demolished Dominica. My people are constantly living in fear that one of these hurricanes will just come and we will lose everything. We see the progression where a hurricane is now three times the size what it used to be ten years ago. And we are expected to experience severe effects of climate change within the next ten years when we are going to lose our lands and our structures. I see it already. Growing up, I went to this beach very often, it was my favorite beach and now it is completely gone. I was looking forward to having that memory so I can show my children and my children can show their children. So now it becomes a very urgent issue. 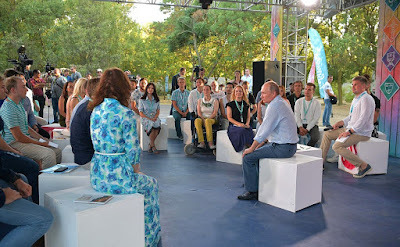 I came to Sochi to meet young people and young minds to find ideas. Because I see this problem. The public is not very educated about climate change and I would like to get my message out there to everybody. I sit on the executive council of the Jamaica Climate Change Youth Council. We are trying our best but I feel that because of the urgency I need more ideas. 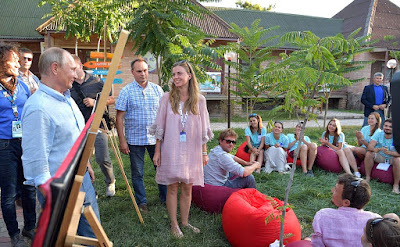 So I came to Sochi to find those ideas, to meet other young people and to network. Because it is a global issue, it is not just Jamaica, it is the entire Caribbean. We are all going to be affected by this eventually. It is just that it is more urgent on smaller islands. Thank you. We in Russia are aware of what you are talking about, and we look on with sympathy and send our condolences over the tragedies that have hit many Latin American countries. By the way, we are always ready to provide assistance and support. We have a very efficient Emergencies Ministry. We usually act under requests for assistance that we receive from national governments. As for the global issue, it certainly concerns all countries. This is why decisions aimed at preventing climate change were taken in Paris, as you are probably aware. Russia has supported these decisions and has assumed rather strict commitments to reduce emissions, and we intend to comply with these commitments, hoping that this will produce positive results. On the other hand, opinions on this issue differ, as you probably know. Some people say that humankind cannot do much to maintain the current conditions due to deeply rooted causes connected to more than just our planet, of a universal nature. They say that changes are taking place throughout our Galaxy and our Solar system, and so forth. These changes are influencing the Earth. This is one opinion and one approach to the problem. Personally, I believe that theories are good, but when we see the situation changing, and not for the better, we must do our best to at least stop the process and possibly reverse it. In this sense, you are in the right place. Russia supports any initiative to preserve nature. I hope you will be able to exchange opinions and possibly hear interesting ideas here. This takes me back to your Indian colleague, who is actually involved in the same thing. Therefore, I hope your stay here will be fruitful. Nicolas Charras, our friend from France and a graduate of MGIMO University, has been living in Russia for several years now. I would like to start off by saying that it is a great honor for me to attend this festival and especially to be here with you at this meeting today. As my colleague has noted, I am not a citizen of Russia. They say I look like a Russian, but those reports are not credible. Nevertheless, I decided to make Russia part of my life when I received an opportunity to study at the Russian Foreign Ministry’s MGIMO University. I was not especially taken with Russia back in school. At the time, I did not know that I would come to this country. If you had told me three years ago that I would learn Russian, my jaw would have dropped. Why Russia? This is a very good question. We could talk about it for hours. From the very beginning, I was interested in geopolitics and Russia’s role on the international scene. There is so much of interest in Russia, it is so vast. And studying geopolitics is basically the same as studying Russia. I have met with truly amazing people whom I never expected to meet. After I spent several years in Russia, television channels started inviting me on, and I now work as an international commentator for media outlets. I appear on various radio and television channels and, in turn, I would like to join my colleague, I have decided to devote my life to improving relations between our traditionally friendly states. Of course, you know perfectly well that there is some propaganda in Europe, as well as significant hypocrisy. Many Europeans are affected by these prejudices. And many theoreticians are saying that Russia and Europe must be pitted against one another, no matter what. You see, if Russia becomes too strong, this would pose tremendous danger to the United States. Today, I would like to drink to Russia and its great future. This is quite Russian. Come on, fill your glass. Thank you. This is a very noble mission and a noble goal. In my opinion, it is quite interesting. Why? Just look what is happening in the world. India, our neighbor to the left, has a population of 1.2 billion, and China has a population of 1.5 billion. The United States continues to receive more and more immigrants; and, as far as I understand, its White Christian population is already outnumbered. You say ‘of course,' but this has changed only recently. White Christians have become a minority, less than 50 percent now. What I am talking about is that the world is going through dramatic, global change. I am not saying this is good or bad, just that global changes are going on. You have said Russia is a vast territory and it is indeed so – from its western to eastern borders, it is a Eurasian space. But as regards culture, even language, language group and history, this all is undoubtedly a European space as it is inhabited by people of this culture. I am saying this because we have to preserve all this to remain a significant center in the world – and I do not mean it in the military sense or anything else. We should not divide everything based on ethnicity and should not look back thinking, say, of the war between France and Russia in 1812–14, but rather look to the future for ways to build a common future and follow this common path. This is how we can preserve this vast space and these people as a global center that is significant for relations with Asian countries and the American continent. If it does not happen this would mean division into minor quasi-national associations of states that would eventually lose their significance in the global sense as independent centers. That is very true. If we preserve it, this will be a great advantage for human development as well, because it is a major part of the global culture and it certainly has to be preserved. That is why what you do is very interesting and needed. I would like to wish you every success. I hope your conversations here will be of benefit, too. Simbarashe Mhuriro, our friend from Zimbabwe, deals with energy conservation. He will tell us about this is more detail. You have the floor. Your Excellency Mr. President, thank you very much for the invite to Russia. I will first touch on my project and company. Then I will come back to the more interesting reason as to why I am here. I founded a company called Oxygen Africa. We are a solar company and we specialize in the building, owning and operation of solar power plants. When you touched upon companies finding it hard to move towards newer technologies, we believe we have answered that question. So our model basically is, we go to a company and we install the solar solution but they do not buy it. We basically sell them the power for the next 20 years. Why do we do this? It is to remove the technology risk from the company. It puts the financial burden on our balance sheet so that there is no capital expenditure from the company itself. They are able to predict the energy costs so basically they can hedge what a third of their energy cost is going to be in 20 years, which allows them to plan for their business. Now, it evolved this way because people think we are a solar company, but what we are is actually an asset management financing company. And we identified certain companies and said: look, blue chip companies, you obviously want to go green. What I would do is I would secure your pension fund for you. So your pension fund will invest in my business and I will then install solar onto your rooftop. In other words, the money that was supposed to go into the state utilities for electricity comes back onto the balance sheet as returns. I then went to the banks that bank these blue chip companies. I said, look, will you give me non-recourse finance? If I do, for example, a solar solution for Old Mutual that you are working with now? They said, yes. So now the bank has got a reason to bank their client, to give new ways of giving finance, but not on the company’s balance sheet but on my balance sheet. We created a new system that involves the financiers, the insurance and the clients whereby everybody establishes value for the business financially but through renewable energy. That way we are able to ease the burden of moving to a newer technology. So that is pretty much what we do. Our project is 20 MW. It has been recently funded by the African Development Bank. It is considered the largest commitment by a single company to renewable energy in Sub-Saharan Africa. So we hope that by the end of the project we will have 226 buildings in total that will be powered to one-third by renewable energy. Back to why I am here, it is actually a funny story. I have a book here that I got when I was five years old. I had a Korean neighbor, when I was five years old, who gave this book to my mom. And I used to love to read it a lot. It is just a pictorial. Thirteenth (WFYS) Festival of Pyongyang in Korea. So when I got the invite to come to the festival I looked at the logo and I thought: where did I see this particular logo? And then when I went home I found it and thought, what are the odds that this was my favorite book as a child, but 27 years later, I am here, making an address and presenting what I do to you. So hopefully I get you to sign it as well. The other aspect I want to touch on is I noticed that in my country, Russia is coming more on the minerals and mining perspective. But I believe the big opportunity is in agriculture. And the reason I say this is our sister company actually imports a lot of raw materials from Russia – your potash, etc.. And they are the second largest manufacturer in the country. So I thought to myself that the future of Africa is actually in agriculture. And possibly Russia has a bigger role to play. In forms of finance, exports as well as, probably, in terms of getting the produce out of the country itself. So in a nutshell, this is me. I think you have come to the right place. It will be useful for you not only to update your impressions of our country from the books you read as a child, but also in a professional capacity. But first, I would like to say that we are paying significant attention to renewable energy sources. Just recently, Russia was lagging behind in this area whereas now, for example, our solar panels are universally recognized as the world’s best in quality, service life and efficiency. This is why I am drawing your attention to this, and it is worth thinking about using them. They are produced by one of our private companies. Initially they operated in Switzerland but then transferred their production to Russia and upgraded the panels. Now they have advanced significantly and their panels are among the best in the world. This is my first point. Secondly, I have to say that solar panels are used not only in African countries, but also, strange as it may seem – you surely know this, although it is not common knowledge – they are used in our Extreme North, in particular, to warm up oil pipes. These solar batteries are used to make sure oil does not freeze in the pipes. I was surprised to learn about this. It appears that such a small amount of solar light (simply light, not even warmth) is enough to warm up oil in the pipes. Therefore, traditional and renewable energy sources are linked and will go hand in hand for many years. This also concerns environmental protection, those same emissions. However, today coal still comes first in overall generation. Some experts believe that it has lagged behind heating oil and gas but I think it is slightly ahead. It is also necessary to think about these traditional energy sources because coal can also be processed to be eco-friendly but this costs money, although, after all, everything costs money. Everything is expensive in the beginning. As technologies improve, as research pushes new boundaries and is applied in practice, this will all become cheaper and, as a result, widely used. In any event, you are involved in a noble effort and I would like to wish you success. I would like to pass the mic to another female member of our group. Let me introduce Anna Kudryavtseva, a young scientist and the head of the Genome Centre. I know her; I presented an award to her. I am so nervous, still overwhelmed by the ceremony, so I will not be able to say anything serious. Perhaps there is no point in talking about what happened before the ceremony. You know the result. But I can tell you how I got here. I think I was born with the desire to work in medicine and science. Even as a child, it seemed like I could literally feel people’s illnesses. I wanted to become a doctor and to understand how the human body works. But my parents wanted me to become a musician. I had to overcome enormous obstacles to finally be accepted to the university where I wanted to study. However, I did not study medicine. I studied biology. As a matter of fact, my whole life seems like a chain of amazing coincidences. In the end, I did the right thing because doctors not only have to possess the ability and sincere desire to help but also nerves of steel – otherwise they just burn out. It is hard to be a doctor when you are very emotional and put all your heart and soul into this job. I studied at St. Petersburg University. I must say it is an excellent university. The education I received allows me to feel completely comfortable both in Russia and at international conferences. It gave me a very good background. After the university, I moved to Moscow and got a job at the laboratory of the now, unfortunately, late Academician Lev Kiselyov. My specialisation was oncology. After defending my thesis, I was thinking what I should do next, and was waiting for a sign. And then something amazing happened. I was walking with my son at 10pm after a New Year party at the institute, and I saw the director walking to the metro, he was not driving either. This was a big coincidence, I could not believe it. Our Institute of Molecular Biology is a respected and high profile institution, our director is Alexander Makarov. And it is not that easy to become head of a laboratory. He does a lot to support young specialists, but not right after they receive their degree. Such a coincidence. I managed to do everything well We launched the equipment, and I was put in charge of the lab right after defending my thesis. This was an interesting time in my life, an important milestone. After that, I worked a lot, and the next stage was the award. It was a significant and important stage and a step forward because I reassessed my views on research in many ways while I worked in fundamental science, and I proceeded to work at the Herzen Institute, a clinic with real patients and doctors. Now I understand how it all happens in real life. The way it works in Russia, researchers do their oncology research at their institutes, while doctors are involved in totally different work at clinics, and they rarely cross. As a result, researchers have little idea of how patients are treated and the plans used, and what doctors actually need. Therefore, when I started working there everything in my life was flipped upside down: I realised what should be pursued and why, and how to go about it. This made me feel very sad and I was indeed eager to do something practical at this stage. I am not saying that I am giving up fundamental research and moving into applied areas but I developed a desire for practical work and chose several projects. However, I would like to point out that the media should not merely inform but write more often that fundamental science is the foundation and it is impossible to do without it. And, of course, now respect for scientists is growing gradually. It disappeared at some stage in Russia but I hope to God that… I have three major projects, and two of them are linked with a very important issue for Russia – reproduction. We have a strong country, of course, and our people are smart. It is very frustrating that we are lagging behind in some way. Actually, there is a large category of cancer patients where we are facing certain difficulties. It is for these patients that apart from getting a clear picture of… Actually, all this exists but simply cannot be used at the moment because society is not quite ready – it should be prepared somehow for this this, and the legislative basis is not fully ready, either. In other words, we need some programs because people can only afford such technology if there are state programs. Moreover, it is impossible to do this in isolation from genetic research. Since I work at the Herzen Institute, they already have a team that has started working on this. As for me, I am eager to promote this project and see it through. This would be my contribution, something useful for the people. However, this gives rise to a tricky question that may spread to many other areas. A researcher in a lab knows better than others what should be done in legislation because he knows these problems. But he does not have enough education to deal with these problems because he is not a lawyer. Look, you have been lucky your entire life. You first won the right to go into biology and medicine rather than music. Then you defended your thesis. Then you met the director of your institute by accident and got a lab. Now you are sitting next to Deputy Chief of Staff of the Presidential Executive Office Mr Kiriyenko. Make sure he has everything and he will help you organize work on expanding and upgrading the legislative basis. That is all you need to do. And you do not have to lose touch with your biology machine. I would like to wish you success as well. Daniel Bell, a young teacher from the United States. Daniel, please. First, thank you very much, Mr. Putin, for hosting us tonight. If you will permit me, a happy belated birthday to you. Thank you also to the organizers for starting this event. My time here actually began a few days ago, in Moscow, at the parade where 300, more or less, students my age from all over the world gathered to build relationships and get to know each other. The opportunity that this event has presented is to examine these political problems and the global problems through a distinctly non-political lens, a human lens, to examine the human universal experiences that are coming from all that what we do. And in that time at this parade I met the students from Iran, Iraq, Syria – intelligent, driven young people my age who care about their countries and care about their respective problems. And in that moment you realize and you see more clearly than anything else that these distinctions we draw between ourselves and these complications, these abstractions we create around these problems are just that. And what lies there and what is really important is the human heart and the experience. You mentioned our healthcare debate in the United States. I believe that that debate is at its worse and we do not realize the human element, the human effect, that people’s lives are what is there and we use instead the easy political thing to abstract and confuse. So for me language and teaching and education are means to that, they are shortcuts on the way to touch the deepest, most intimate things we feel as human beings, our identities, who we are. And as I prepare to go to Brazil to teach English that is what I hope to do. I experienced that learning languages. What I experienced here is that even knowing one word is just a shortcut straight to what another person thinks. This festival offers the opportunity to really engage with people of different nationalities and I have done that and I hope to continue to do that in all these different countries. This is my first time in Russia and I have got to meet a lot of young, driven Russian people my age who care about their country and care about these problems and care about the world they live in. And what I sincerely believe is I do not see them as my rivals. I hope they succeed. Because we need intelligent young, driven people to tackle these issues, whether it is curing cancer, climate change, cleaning our environment. To paraphrase, no one people, no one nation, no one region of this world has a monopoly on answers, has a monopoly on solutions. And to tackle these things we need to be constantly connected to each other and driven and not get distracted by the things that are very easy to look at, and to realise that ultimately, this probably will affect all of us. And they are interconnected and we are interconnected as members of this planet. And the West does not start in Los Angeles and St. Petersburg. We draw these lines. And events like this give us the opportunity to see that they are just lines and what is behind them is human lives. So again, thank you very much for hosting us and for the opportunity to be here today. You have just made several very important points. First, you said that no one has a monopoly on advancing their vision of global development unilaterally. This is very true. The world is diverse and this diversity must be respected. I have exactly the same attitude to the things you just spoke about. The second point you made, which I also think is very important, is that we need to stop seeing each other as rivals. I do not know whether it is possible between countries but this is, generally, what we should strive for. We must make the effort to see each other as partners. Here, my neighbor on the left already said something in the same vein. It is a crucial thing that undermines our relations at the interstate level because we see each other as rivals. Instead of cooperating and solving our common problems, we waste substantial resources and get distracted by secondary things. We waste resources on rivalry, on how to appear better and on winning, which does not necessarily lead to a positive result for anybody, the loser or the winner. So, it is a very delicate issue. True, this idea may be utopian because essentially all of nature is competitive and society is competitive through and through. At any rate, we must make sure that this competition does not reach a critical stage and turn into hostility, let alone war. We also need to intensify the second vector, the vector of cooperation, in searching for solutions to common challenges and problems. If we can build our relations to this effect, everybody will benefit, no doubt. Mr. Putin, I think we are ready to wrap up the event. This discussion could go on forever. As you can see, all our participants are very well prepared and knowledgeable. Thank you very much for meeting with us. We cannot let you go without a group photo. The participants have been eager for one, if you do not mind. I would like to thank you for this discussion and for coming to Russia. I really want you to return home in a good mood, with new knowledge and many useful connections. 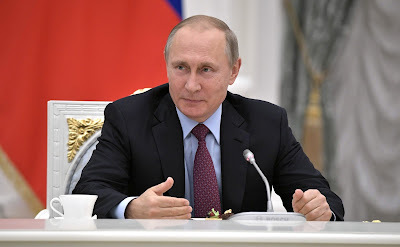 Vladimir Putin sent a message of greetings to participants of the meeting marking the 50th anniversary of the International Association of Teachers of Russian Language and Literature (MAPRYAL). International Association of Teachers of Russian Language and Literature. 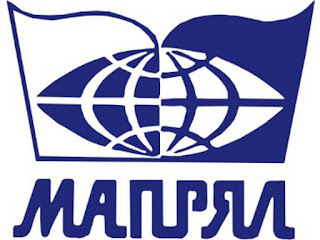 "Over the past years, MAPRYAL has earned high and well-deserved recognition as the largest international association focused on the development, study and promotion of the Russian language and literature. Today, MAPRYAL is successfully operating in 70 countries. Its members include the world’s major universities, language schools, publishing companies as well as prominent researchers, teachers, journalists and public figures. The association has moved forward some popular educational projects and outreach campaigns. It is involved in extensive research and develops new and promising teaching methods, and organizes academic and cultural events. I am certain this anniversary conference will be a creative and constructive event initiating some extraordinary and useful projects that will definitely be brought to life." 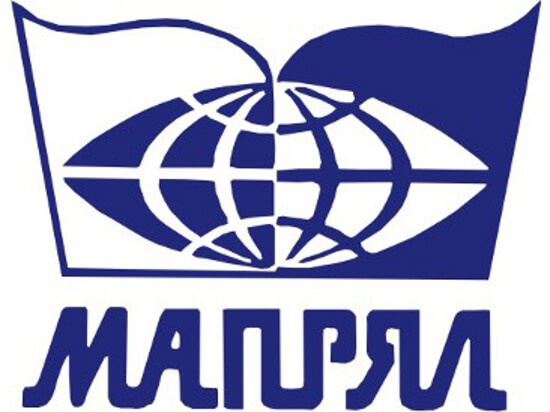 MAPRYAL’s anniversary conference is taking place on September 15 in Paris, where 50 years ago the International Association of Teachers of Russian Language and Literature was established as a public non-profit organization at its foundation conference. Vladimir Putin visited Sirius Educational Center. Russian President was brought up to date on the work of the Sirius Center, watched a hockey match between junior teams in Shaiba arena and talked with hockey players. Vladimir Putin and Sergei Sobyanin in the Sirius Educational Center. 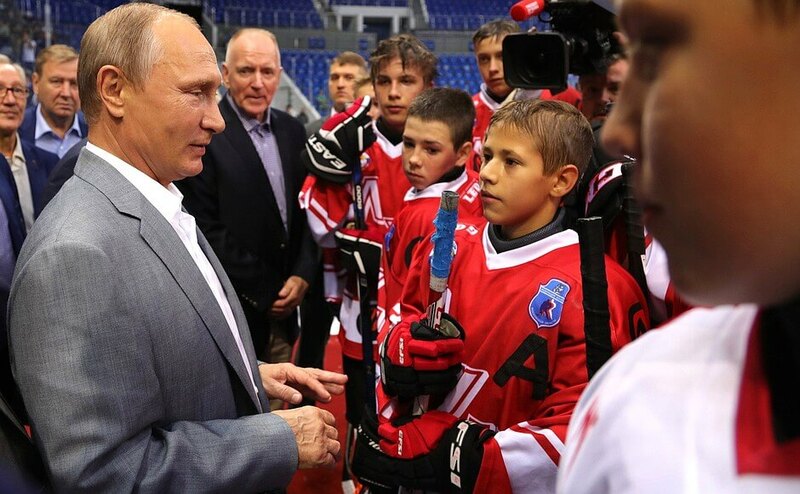 After that President met with hockey players who took part in the 1972 USSR-Canada super series. The meeting was attended by Russian and Canadian hockey players who took part in these matches. The USSR-Canada super series were held in September 1972 in a number of Canadian cities and Moscow’s Luzhniki Stadium. Firstly, we congratulate all of you on your play – those who won and those who lost – it does not matter. Today we brought here outstanding hockey players, people who have done so much to grow the sport of hockey: the Soviet and Canadian hockey players who competed in the outstanding series in 1972. This series pushed hockey forward. Owing to this series the world’s interest in hockey grew, so let us welcome them. You have opportunities today that we never had. As the President Putin and I discussed, we only had 30 skating rinks in 1972. Five hundred rinks have been built since Vladimir Putin took office and we want you to derive the same satisfaction from the game, strive to become like Vyacheslav Tretyak and Alexander Yakushev and play for the Russian team. All the best to you. Good luck. Vladimir Putin with junior hockey teams in Shaiba arena. 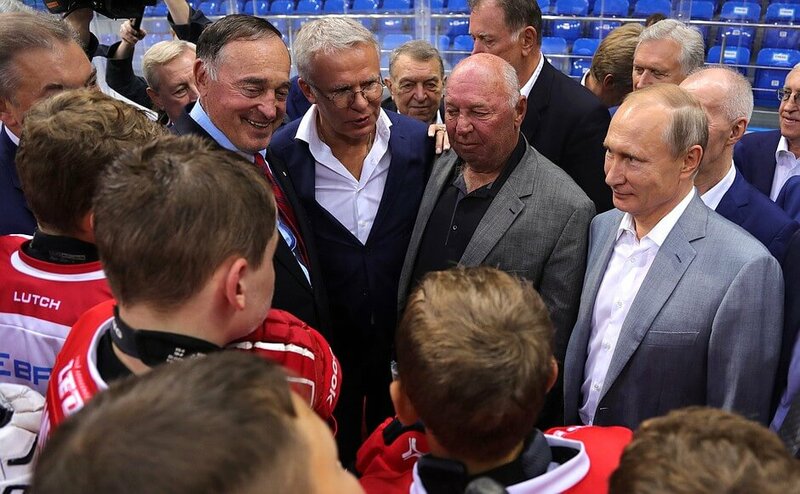 Vladimir Putin after the hockey match in Shaiba arena. 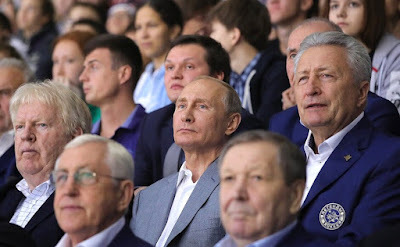 Vladimir Putin during the Hockey match in Shaiba Arena. 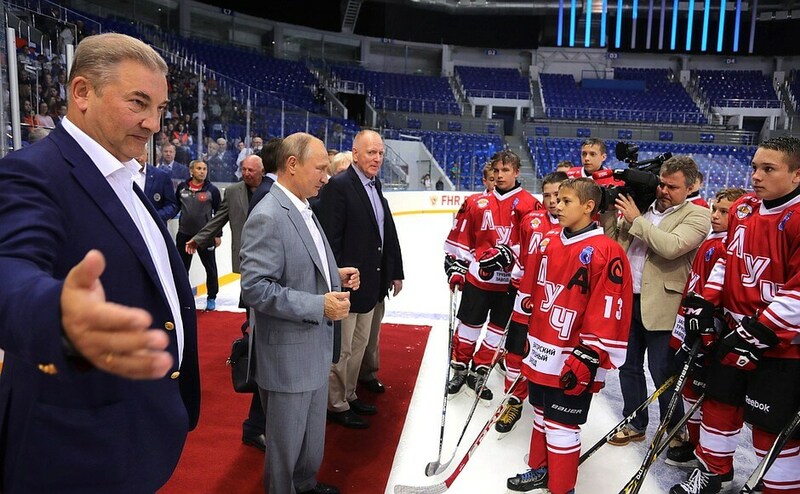 Vladimir Putin and junior hockey teams in Shaiba arena. 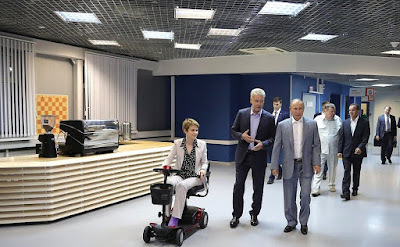 Vladimir Putin and Sergey Sobyanin in the Sirius center. 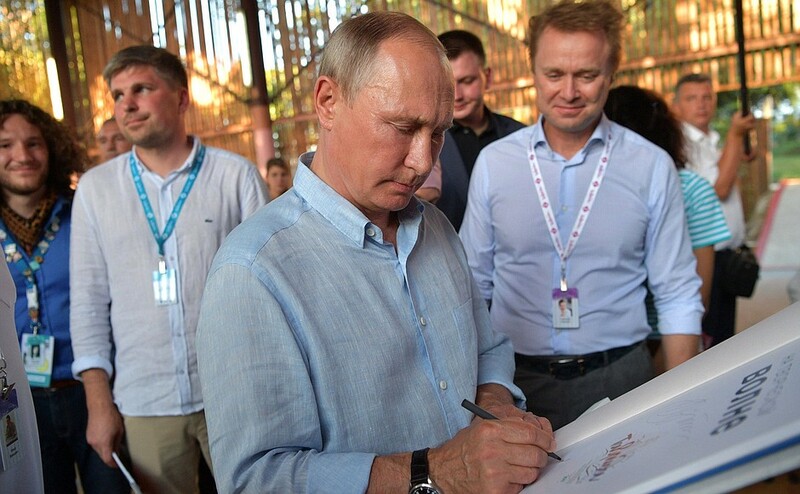 Vladimir Putin during his visit to Sirius Educational Centre. Vladimir Putin held the national open lesson Russia Focused on the Future. 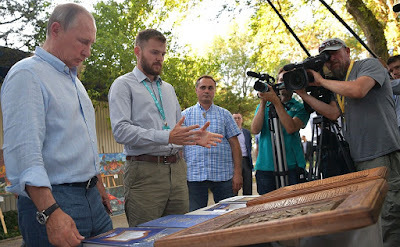 The event took place during a working trip to the Yaroslavl Region. 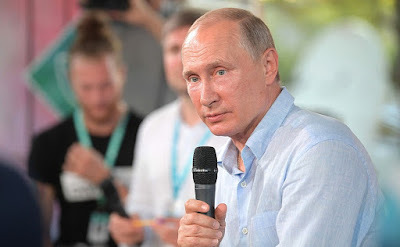 Vladimir Putin at the national open lesson Russia Focused on the Future. More than 1 million schoolchildren around the country were expected to watch the open lesson online. 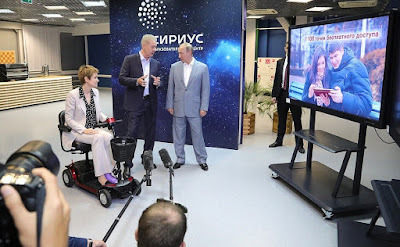 All participants in the lesson watched videos about the large-scale innovative projects underway in Russia, in particular, the Northern Sea Route transport system’s development, new generation universal nuclear icebreakers, a super-heavy class space launch center, additive technology centers and telemedicine projects. 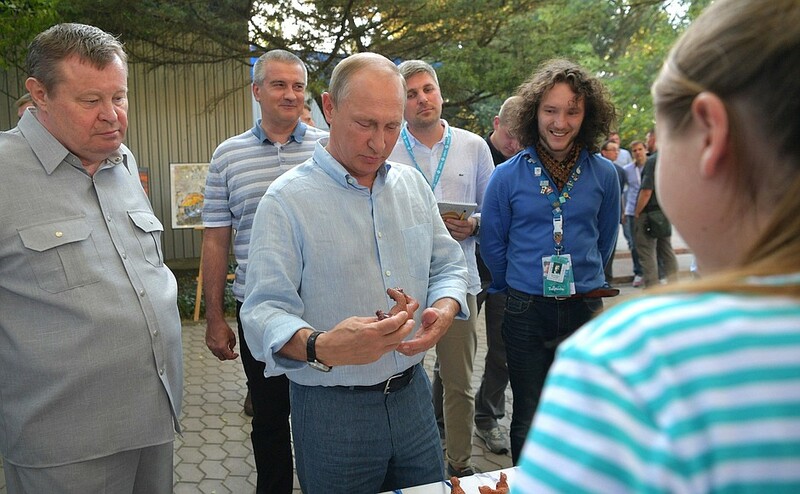 Vladimir Putin visited the ProyeKTOriya national professional orientation forum. Vladimir Putin during his visit to the ProyeKTOriya national professional orientation forum. 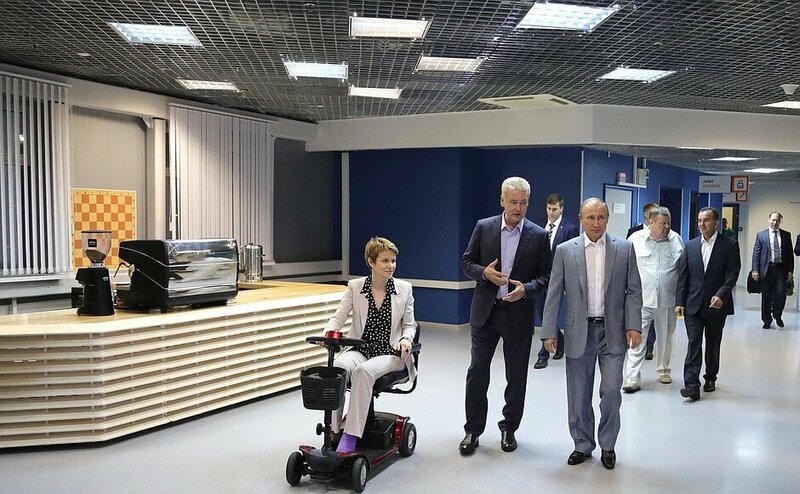 President Putin visited the information, energy, space, and materials technology sections in particular. The forum first took place in 2012. This year, more than 500 senior-level schoolchildren with an interest in engineering and the natural sciences, and their teachers, are taking part. 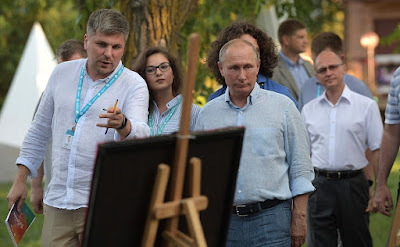 Vladimir Putin attended the Tavrida National Youth Educational Forum during his working trip to the Republic of Crimea. 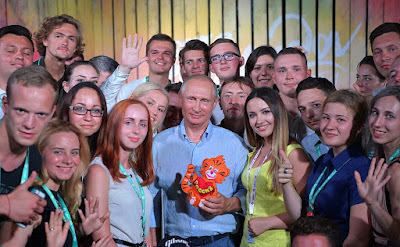 Vladimir Putin with children at Tavrida National Youth Educational Forum. Vladimir Putin was introduced to thematic exhibitions of various creative teams, photo artists, architects and urban designers. 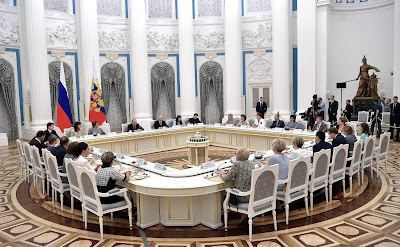 Russian President spoke in an informal setting with both organizers and participants of the annual forum. The Tavrida National Youth Educational Forum is taking place in Crimea for the third time. It traditionally brings together talented young people and experts from various fields – design, architecture, literature, history, fine arts, music, cinema, cartoon animation, journalism, and museum studies. The event aims to form professional communities comprised of creative young people. The forum is organized by the Federal Agency for Youth Affairs and the Russian Centre for Civil and Patriotic Education of Children and Youth (Rospatriottsentr) together with the Moscow State Institute of Culture. Vladimir Putin answered the questions during the Tavrida National Youth Educational Forum. Vladimir Putin visiting the Tavrida National Youth Educational Forum. 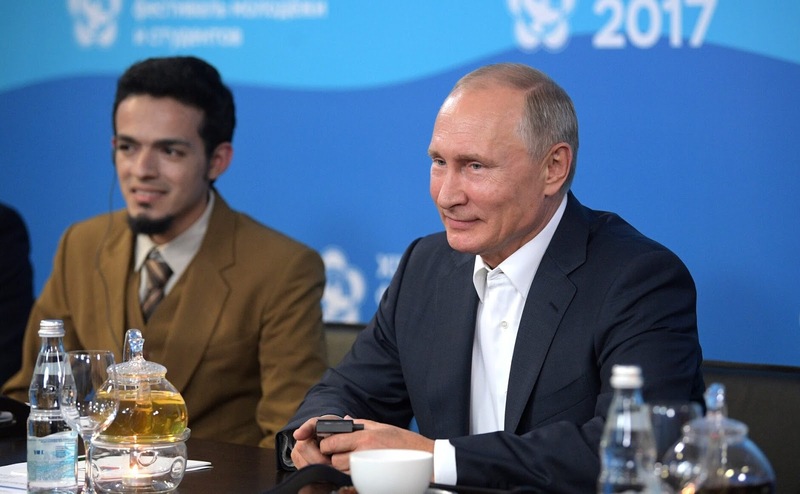 Vladimir Putin attended the Tavrida National Youth Educational Forum. 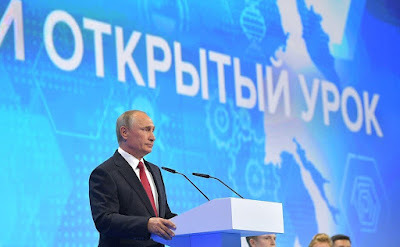 Vladimir Putin at the Tavrida Educational Forum. 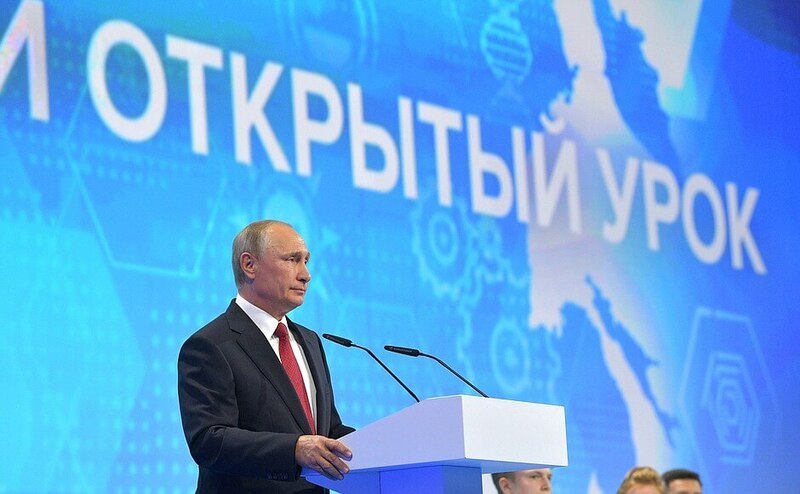 Vladimir Putin at the Tavrida Educational Forum in Crimea. Vladimir Putin with children at the Tavrida Educational Forum. 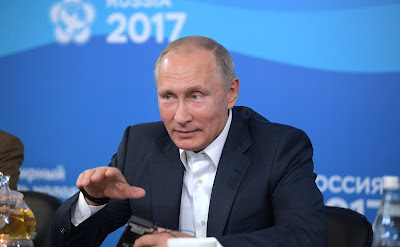 Vladimir Putin at the Tavrida National Youth Educational Forum. 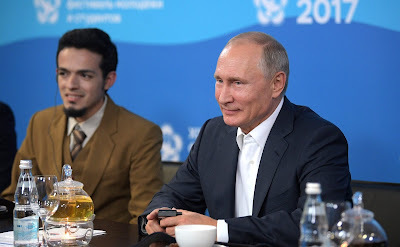 Vladimir Putin attending the Tavrida National Youth Educational Forum. Vladimir Putin sent greetings to participants, organizers and guests of the 10th National Forum of School Librarians Mikhailovskoye 2017. “Your forum has become a respected research and practice platform for discussing current issues related to the improvement of library services, the modernization of school libraries and the provision of the latest technologies to them. The attainment of these goals is crucial for the development of education and for the personal growth of our young people. Libraries have always been the centers of education and useful recreation and also unique depositaries of scientific knowledge and our rich historical and cultural heritage. The Mikhailovskoye Museum Reserve, where the 10th National Forum of School Librarians is being held, is associated with the life and work of the great Russian poet Alexander Pushkin. Greetings to Tavrida National Youth Educational Forum. 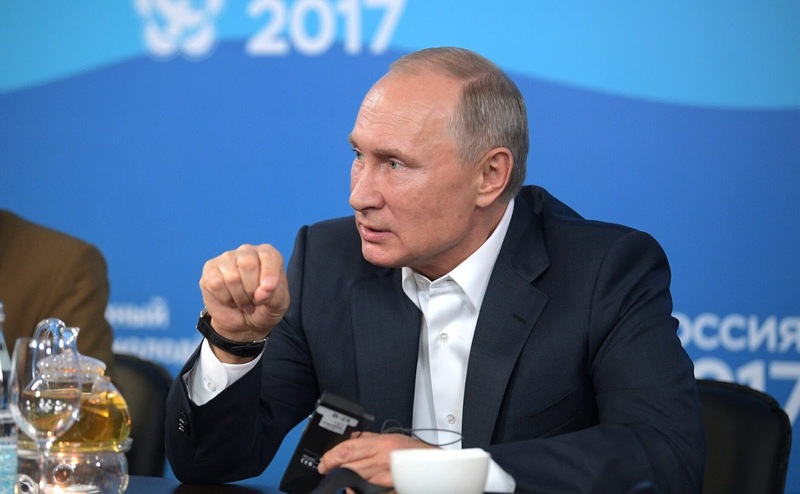 Vladimir Putin sent greetings to participants, organizers and guests of the Tavrida National Youth Educational Forum taking place in the Republic of Crimea between July 3 and August 31, 2017. “Today we can say with confidence that this forum has become an excellent and popular platform for active and talented young people who are sincerely dedicated to meaningful and important ideas and are prepared for a result and a practical outcome. The full program, as always, allows participants to become involved in constructive and creative discussions with experts, representatives of government authorities and business, academic figures, educators and cultural workers, and gain valuable life experience. The program, of course, includes various competitions and sporting events in a friendly and informal atmosphere. 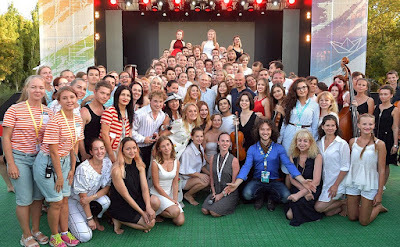 The forum’s participants include around 3,000 young people aged from 18 to 30, including teachers of creative occupations and young professionals in various creative fields from all across Russia. 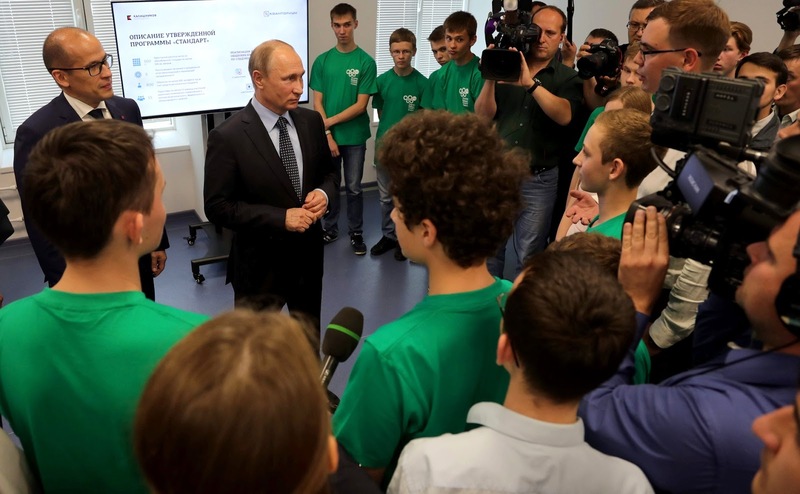 Vladimir Putin met with young specialists of the defense enterprise Kalashnikov Concern and pupils who won science and technology contests and competitions. Russian President with young specialists of Kalashnikov Concern and pupils of Udmurtia schools. The defense concern plans to form an educational cluster in the region in order to train personnel for the enterprise at the secondary school level. 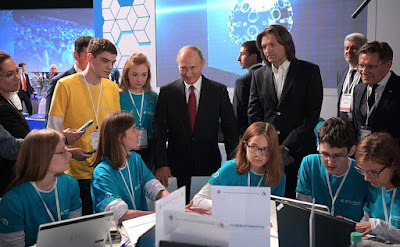 To fulfil this task, the Government of Udmurtia, the Kalashnikov Concern and the Republican State Centre for Multi-Component Computer Environments signed, in the presence of the head of state, an agreement on cooperation in providing science and technology education to young people and getting the younger generation involved in innovation. The President attended the signing of an agreement between the Government of Udmurtia, the Kalashnikov Concern and the Republican State Centre for Multi-Component Computer Environments. Vladimir Putin with young specialists of Kalashnikov Concern and pupils of Udmurtia schools. Meeting with graduating class teachers. The meeting on the eve of Graduate Day was attended by homeroom teachers whose students scored high during the final performance review and distinguished themselves in the preparation and holding of extracurricular events. 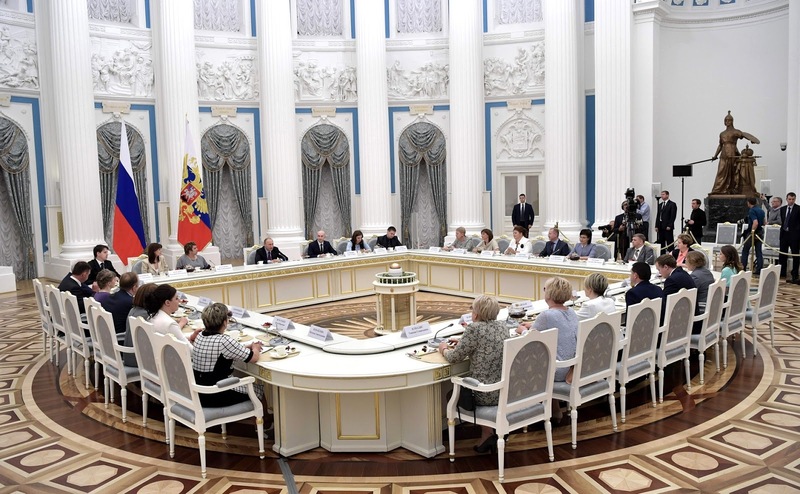 At the meeting with the head of state, teachers spoke about the peculiarities of the educational process in secondary schools and about fostering good values in teenagers, and also discussed opportunities of general educational institutions to provide career guidance. Good afternoon, friends. I meet school teachers more or less regularly – not as often as I would like to but still regularly – during meetings with winners of various contests, on celebratory occasions or in connection with student results. However, I have never met with instructors or homeroom teachers, especially on the eve of graduation day. Therefore, at the outset of our conversation I would like to extend my very best wishes to you, your students and their families on this holiday. The holiday is truly unique. Every person, almost every person remembers it as a good and vivid event in our lives and destinies. Of course, they and you had to work hard to make it happen. Today we are witnessing the development of many new, interesting, and effective methods and new ways of teaching. New technology is being introduced. Everything meets the requirements of today – at any rate we are striving for this. This leaves an imprint on your current activities and results. I know that you are all from successful schools and you are all accomplished and successful teachers. You have medalists and winners of academic contests but naturally, apart from the strictly professional success achieved by you and your students, you also have to deal with a different component of your work – upbringing. I suggest discussing all components, your thoughts about the results of this year. Maybe you have suggestions on what else the relevant ministry should be doing and in general, how we should adjust the school system to make it even more effective than it is today. Needless to say, I hope very much and we all hope that on entering their new, adult life and acquiring new qualities, your students will make the most of the knowledge and skills they received at school. I am referring not simply to knowledge but also – and this is no less important – to the fundamental principles of a person’s attitude to life that you certainly tried to develop in them. Acquiring knowledge is not easy, especially given the extent of it today, but this task is still secondary compared to the upbringing of young people, which develops in them the right attitude to themselves, their friends, families and the Motherland. These are absolutely fundamental things. Only if this is achieved it is possible to hope that young people will be well-rounded and content with life while being easy to deal with. This is what you have been doing not only as experts in different disciplines but also as educators, as homeroom teachers. We do not have a strict agenda. Mr. Fursenko [Presidential Aide], Ms. Vasilieva [Minister of Education and Science] and I are all at your disposal. 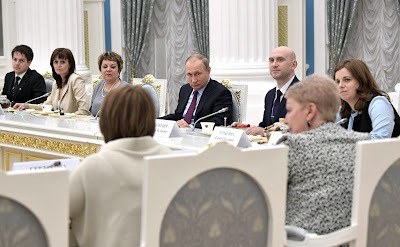 Vladimir Putin at the meeting with graduating class teachers. Russian President at the meeting with graduating class teachers in the Kremlin.